Okay, now back to our regularly scheduled opening analysis from Dana’s Secret Chess Filesâ„¢. In my previous “Bird by Bird” entry I outlined the general strategic themes of the Bird Variation of the Ruy Lopez: 1. e4 e5 2. Nf3 Nc6 3. Bb5 Nd4. Note that although White has lots of plans available, Black’s plan of development remains fairly consistent over all of the variations: the plan is to play … g6, … Bg7, … Ne7, … c6 and … d5 in some order. So I am going to categorize the main variations, as I see them, according to White’s development plan. For each variation I will also show you which post I will discuss it in, andÂ my lifetime tournament won-loss-drawn record. In some sense you don’t really have to study this line. As I said in my last entry, White will only play 5. c3? by mistake, and it’s an immediate sign that he doesn’t know this variation. However, I do want to devote an entry to it for two reasons: first because I have a couple of really nice games to show you, and second because you will face it now and then and IÂ would like to offerÂ a few words of advice. The first advice is do not get cocky, especially if White plays 6. Bf1. Yes, he’s sitting there with egg on his face because he has had to undevelop his only developed piece. But just remember that having egg on your face is not fatal. White has created no weaknesses. Black, by contrast, does have a somewhat shaky pawn on d4, and also his queen is in a very strange place and will have to relocate. The good news for Black is that he has gained a tempo (or two)Â and has the initiative, and thusÂ he can look forward to extremely comfortable equality. But Black does not really have an advantage yet. Your best hope is that your opponent, who has already been rattled, will make some more mistakes. After 6. Bf1 I have always played 6. … Bc5. One tournament game (Pearson-Mackenzie 2001) continued 7. cd Bxd4 8. Nc3. White is hoping to play d2-d4 with a tempo instead of settling for d2-d3, but it’s just not in the cards.Â I played 8. … Qf6 9. Qe2 c6 with a fine game and eventually won. The other two games went 6. Bf1 Bc5 7. d3, and now the question is, where does Black put his queen? The trouble with 7. … Qg6 is that White can play 8. Nd2 with the threat of Nb3, and Black’s pawn on d4 is too lightly defended. 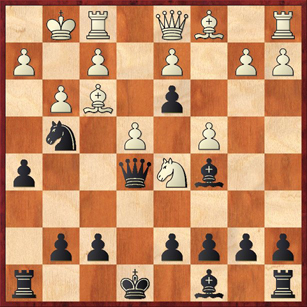 If you’re adventurous, you can try sacking a pawn here with 8. … d5! ?, but I’m not sure I really believe it after 9. cd Bb6 (not 9. … Bxd4?? 10. Qa4+) 10. Nf3 de 11. Ne5! (as recommended by Fritz). So 7. … Qf6 seems better. The only problem with this move is that after White’s response 8. Qf3, an early queen trade is in store and the position could get somewhat drawish. Another possibility suggested by Fritz is 7. … Qh4? !, with the idea of trying to tempt White into playing 8. g3? Qf6! and now Qf3 is not possible. However, White has plenty of other possibilities besides 8. g3, and the queen on h4 will be just as vulnerable as it was on g5, so IÂ can’t really recommend this. However, things get a little bit spicier if White, instead of playing 6. Bf1 and calmly accepting the egg on his face, decides that he wants to keep his bishop developed with 6. Be2? Here is a case where White, by failing to admit his first mistake, makes matters worse by committing a second one. Now the pawn sacrifice 6. … d3! is really promising for Black. I’ve had two tournament games with this move. One of them, Robert Cale-Mackenzie 1990, was a bitter and shocking defeat for me, which I will show you below. It’s a great lesson in hubris. Fortunately, I got a chance to redeem myself 12 years later in Mantri-Mackenzie 2002, a game for which I won a (somewhat undeserved) brilliancy prize. I’ll show you that game as well. If White now plays 7. 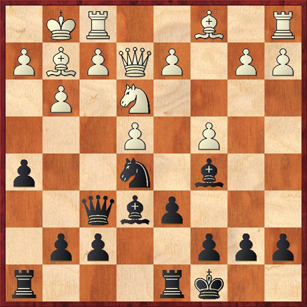 Bf1, Black sacs a pawn for a tremendous attack with 7. … d5! 8. Qf3 Bg4 9. Qxd3 O-O-O and probably White should give the pawn back with 10. Qe3 Qxe3+ 11. de de 12. Be2, a superior endgame for Black because after the bishop trade he has a space advantage, the good bishop, and a nice outpost for his knight on d3. Cale played 8. c4, with the idea of Qd1-b3-d3. I replied 8. … Nf6 9. O-O Qe5 (planning to meet 10. Qb3 with 10. … Nxe4) 10. Nc3 h5 11. Nd5 Ng4 12. g3 and now I played a move that I am still very proud of, all these years later. Just to confirm: If 13. Nxc7+ Kd8 14. Nxa8 Nxh2! 15. Kxh2 h4 16. Kg2 Bh3+! 17. Kxh3 hg+ and Black’s attack is irresistible. 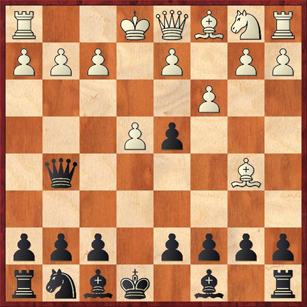 What a line — sacrificing a rook and two pieces! This is where I started to display hubris, which the dictionary defines as “excessive pride or self-confidence.” After playing this move I was sure that I was going to win the game brilliantly, and in the moves to come I was first frustrated by my opponent’s strong defense and then failed to see his counter-threats because I was so preoccupied with checkmating him. Excellent! White passes up the material gain and uses his knight, as I said, to gum up the works. 13. … Be6 14. Qb3 O-O-O 15. Qxd3 Qf6! White cannot simplify with 16. Nxg4 hg 17. B moves because of 17. … Rxh2!! I’m still in my comfort zone, with brilliancies floating around ready to be snatched. Looking back at this game now, I find it really surprising that I didn’t play the natural 17. … h4, continuing to pry open White’s position. For instance, if 18. Nd5 Bxd5 19. cd hg 20. hg Qg6 Black wins back his pawn because White has no good way of defending g3. Or if 18. f4 Nxc4 wins back the pawn immediately because of the pin on e3. Or if 18. d3 hg 19. fg Qh6 20. Bf3 Nxd3 again wins back the pawn, because White’s queen must not leave the defense of h2. And it is now Black who is in critical danger. I lost rapidly after 20. … Nc5 21. Re1 Qe7 22. b4 Nd3 23. Rf1 b6 24. Be3 (24. Bh3+ followed by 25. Qa3+, winning the knight on d3, was even stronger) 24. … Nxb4 25. Rfc1 b5 26. Rxc4 bc 27. Bh3+ 1-0. What a turnaround! I still have to admire Cale’s resourceful play. He may have gotten egg on his face in the opening, but in the end he threw the whole chicken coop on my head. I finally did get to play a brilliancy in this variation, but it was twelve years later, and againÂ I almost blew it! 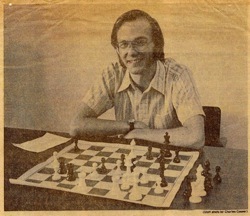 This was a game against Ramesh Mantri, played at the Monterey Chess Center, a run-down but beloved chess and darts emporium that was run by Ted Yudacufski. TedÂ organized tournaments there once a month, and now and then if there was a game he particularly liked, he would give out a brilliancy prize the next month. I think it was maybe $20. By the way, another very instructive line, which shows how much trouble White can get in to, occurs after 8. Qb3, which is the computer’s recommendation. Now 8. … Nf6 9. Qc4 O-O 10. O-O (not 10. Qxd3? d5! — always the thematic move) Re8 11. Qxd3 d5! 12. ed Bd6. 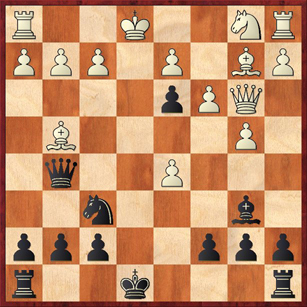 Black has all of his pieces trained on White’s king, and … Ng4 is in the air, while White’s pieces on the queenside are just dead wood. With the text move White tries to speed up the development of his queenside. White still has ideas of playing c4, both attacking the d3 pawn and threatening to trap Black’s bishop on b6. But this move ignores the peril on the kingside too long. A better try was 10. O-O, but even here the computer says Black has plenty of compensation after the thematic 10. … d5. I don’t know if I can even call this a brilliancy. It’s just the thematic move. 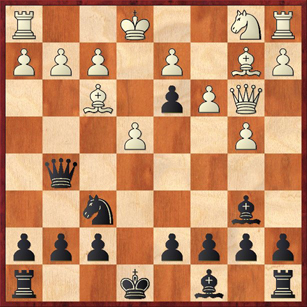 Black blasts open the center before the White king can reach safety, and while the White pieces on the queenside are all still tangled up. Note that 11. O-O de 12. Re1 doesn’t work because, among other things, Black can simply castle. 12. … O-O 13. Bxe4 Nxe4 14. Rxe4 Bh3! 15. g3 Qf6! 16. Rf4 Qc6! Analysis courtesy of Fritz. (I would have been more likely to play 12. … Be6, which is also fine.) Or if 13. Bd1 Bh3 14. g3 Qf5 is again hopeless for White. A very appropriate punishment for White’s lag in development. And now I almost botch it. Too fancy! Just 12. … Nxg4 is awesome. I didn’t play this because I wanted toÂ prevent White from castling, but I should have realized that castling is no relief for him: after 13. 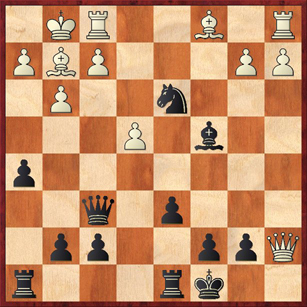 O-O Qh4 White’s king is unlikely to survive to an old age. If 13. c4 Qe7+ 14. Kd1 Nxf2+ 15. Kc1 Nxh1 etc. White botches it back. After 13. Kd1 Nxg4 14. c4 Nxf2+ 15. 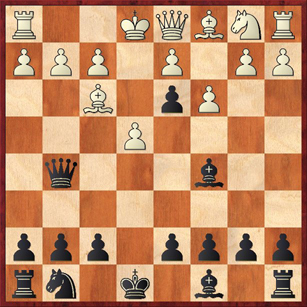 Kc1 now Black can’t take on h1 (as in the line above) because the queen on e5 is hanging. This gives White time to construct at least a little bit of a defense. After the text move, White is just blown out of the water. Finally White rounds up this pawn, but the rest of his position is completely busted. I have been playing the Bird for a long time and am very interested in your series. I am also inspired to put together some stuff myself — perhaps a bibliography (since I recently completed my collection of Bird books with two key purchases). I am very interested in your ideas concerning the …g6 line. I always play the Classic Bc5 line myself, though I am intrigued by g6. The books all say it is not good. But I do like playing g6 in the Open Games as Black (Three Knights with g6 and g6 vs. the Scotch for instance — sometimes the Smyslov Variation vs. the Ruy), so it would be interesting if it were playable. It’s just hard to believe Black has time for a fianchetto given the wasted tempo with Nd4 etc. Flear (in Offbeat Spanish and the recent Dangerous Weapons 1.e4 e5) focuses on Bc5.